With announcement of iPad by Apple, various PC makers like Dell, HP, Asus and MSI are trying to grab some spotlight by releasing information about their upcoming tablets, even though most of these tablets won’t ship till second half of this year. HP was the first to jump the gun by releasing a video (added below) in which company’s CTO Phil McKinney talks about the upcoming HP Slate PC. Mobile-review’s editor Eldar Murtazin twitted yesterday “Playing with WM7 device – battery 1850mAh, working only 6-7 hours (half a day). So, desktop OS in mobile phones – welcome in MS world.” Eldar also revealed the minimum hardware specifications required for upcoming Windows Mobile 7. Evgenij Pavlov of HTC Russia informed Eldar that Windows Mobile 7’s minimal hardware requirements will be 1GHz CPU, 3.6-inch WVGA screen, 8GB onboard storage, 5-megapixel camera, compass and G-sensor. Apple today introduced iPad, a revolutionary device for browsing the web, reading and sending email, enjoying photos, watching videos, listening to music, playing games, reading e-books and much more. 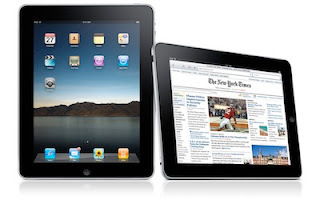 iPad is just 0.5 inches thick and weighs just 1.5 pounds— thinner and lighter than any laptop or netbook. iPad includes 12 new innovative apps designed especially for the iPad, and will run almost all of the over 140,000 apps in the App Store. 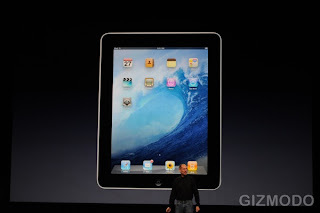 iPad will be available in late March starting at the breakthrough price of just $499. We will be doing a detailed post about the Apple iPad later two check it out on TechzTalk. That's it for the presentation. The images in the posts were taken from Gizmodo.com. Thank you Gizmodo. Steve says that there is a hands-on area where we can check out the tablet today. 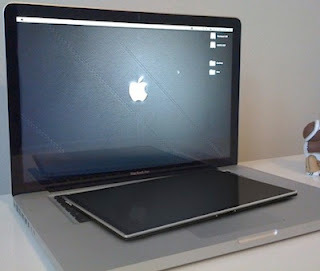 It uses top of the line components like IPS LED backlit LCD panel and new Apple A4 processor. 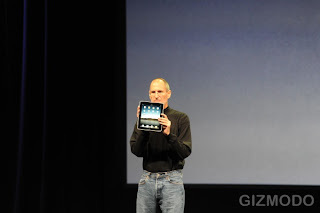 Steve "iPad is our most advanced technology in a magical & revolutionary device at an unbelievable price." 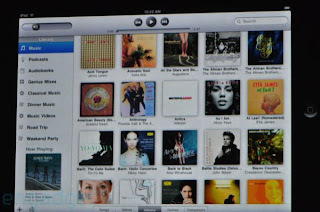 There are over 125 million accounts on iTunes and iTunes along with App Store and iBook Store is ready for the iPad. Steve is back on the stage and he is saying that Apple has sold over 75 million iPhones and iPod touch and that's 75 million people who already know how to use the iPad. And it looks way better than any tablet shown at CES earlier this month. Jon Ive says in the video "This defines our vision, our sense of what's next." The backlight of the display is LED as we wrote today morning and also like we said Jason Calcanis was wrong about the iPad. Apple is now showing a video of the iPad and accessory. 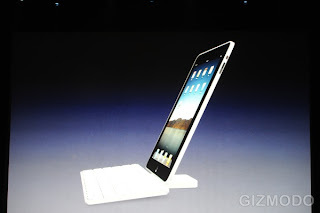 The iPad looks very sleek. First accessory for iPad is keyboard dock that has full size mechanical keyboard. then there is a carrying case. it looks like there is no camera on the iPad. Apple will ship the iPad WiFi models in 60 days and 3G models in 90 days. The WiFi models will be priced $499 for 16GB, $599 for 32GB and $699 for 64GB. WiFi+3G models will cost extra $130 and will be $629, $729 and $829 respectively. But we have had very aggressive price goal, the starting price will be $499 and not $999, like we wrote on our blog yesterday. Steve says how much should we price it? pundits say it would be under $1000 that's $999. Apple is working on international deals and all ipad models have unlocked 3G and they can be used with any GSM carrier. their is no contract. AT&T is the carrier partner and they will allow free WiFi hotspot access. Now wireless networking, iPad has WiFi and some models will have 3G also. 3G data plans cost $60 in us for laptops. 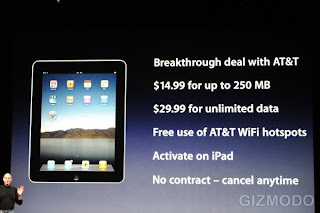 But iPad owners will get first 250MB of data for $15 and unlimited data for just $30. Steve is back on stage and now he is talking about syncing it just works like the iPhone. It syncs everything with iTunes via 30 pin connector, no wireless syncing. iWork looks very good on the iPad and its very easy to work on it , however data entry might be a problem on the virtual keyboard. It Numbers now and again the same story, mostly images no data entry. Now he is demoing pages. he is mostly showing how images are handled on iPad not how texts is entered. Phil is showing Keynote on the iPad and you can drag by holding on the screen, add animation and video. Resizing works just like the iPhone. Keynote, Pages, and Numbers have been specifically designed for the iPad. 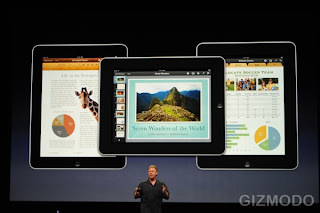 Steve says that Apple has developed a special version of iWork of Apple iPad and Phil Schiller will demo the iWork. Apple is using the ePub format for the iBook so it open and should allow you to import your ebooks also. The UI for books is also very intuitive and browsing through a book is very simple. Steve is showing how easy it is to buy a book and yes the books are priced $14.99. The iBook application has a bookshelf and their is a iBook store button that can be used to go to iBook store, which is almost like App Store. Steve is now demoing the iBook application and store. The iBook application will manage all you ebooks and there is a iBook store from where you can buy new books. The store has books from Penguin, Harper Collins, Simon & Schuster, Macmillan and Hachette. And now ebook reader app. 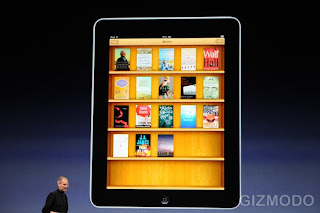 Steve says Amazon has done a great job for ebook reader technology, and now Apple is introducing new app called iBooks. Now Steve is back, he says "Isn't it awesome?" These applications were developed in less than two weeks. Scott is back on the stage. The application allows watching live games with virtual statistic on the screen. MLB.com is on stage to demo their application for the new iPad. we really like the iPad name. it's way better than iTablet or iSlate. Graphics are somewhere better a gaming laptop and Wii. They are not as good as gaming laptop but way better then Wii. The frame-rate is very smooth. And again the graphics are really good for Need For Speed. It is looking better than playing NFS on Wii. EA is demoing a car racing game. Now someone is showing a simple paint application Brushes which looks very good and fun to use. EA is up next. NY Times says we think we have captured the essence of reading newspaper first time on a electronic device. The format also you to change number of columns, re-size text flip through slide show and watch video. NY Times application is very similar to a actual newpaper, but you can skip around like on the iPhone app. its really awesome. 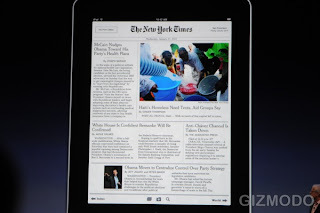 Now NY Times is coming on stage to talk about their plans for the iPad. Gameloft is demoing Nova, which is already available for iPhone. In fact the demo person is holding the iPad like a bigger iPhone and using it the game looks very good on bigger screen. Now demo of various applications made for iPad is starting. Scott invites gameloft. The iPad applications will share the same App Store. Apple will highlight applications specifically made for the iPad. Apple rewrote all their application for this display and the updated iPhone SDK is available today for developers to do the same. The tablet can run iPhone apps unmodified out of the box, tablet can pixel double applications and run in full screen. But it would be a good idea to update application UI to take advantage of bigger screen. Scott Forstall is on stage now talking about applications for the new tablet. Now Environmental check list and it free of everything bad. Battery life is 10 hours like we wrote in the morning. 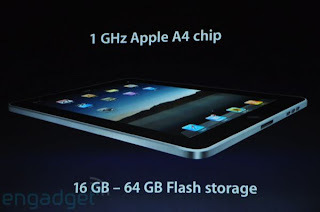 It has 1GHz Apple A4 chip, 16-64GB storage, WiFi, Bluetooth, accelerometer, compass, and 30-pin connector. 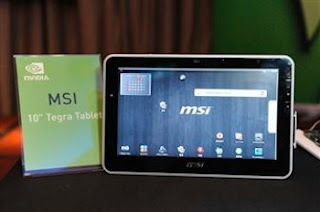 The tablet is 0.5-inch thick, 1.5 pounds and has 9.7-inch IPS capacitive multitouch display. The UI is very smooth and going from one application to the other is just like the iPhone, we think the tablet supports multitasking. Now video it's Star Trek time now. Steve is now showing iCal, it has pop up like on the desktop application for editing appointments. And it is very good and easy to use. However photos in the main library are arranged in stacks. 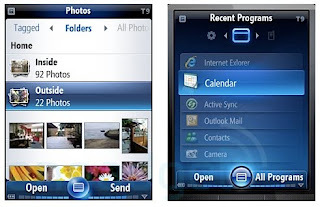 Next Steve shows photos they work just like the iPhone you can flick and use gestures to manipulate the pictures. The virtual keyboard is iPhone like, only bigger. Steve says that its super easy to type, he said the same thing about the iPhone also, which was true. Steve is demoing the tablet and it really fast, scrolling is super smooth and the email client is way better than iPhone. messages are listed on one side and the content of the email selected is displayed on rest of the screen. You have to slide like to the iPhone to unlock and the tablet also doesn't support Flash like iPhone. The tablet has iTunes store built right into it, its awesome to watch TV show and movies and mobile Safari browser is a pleasure to use Steve says. Steve shows the Apple tablet it has iPhone like icons. Steve is asking what kind of tasks this device will do? browsing, email, music, games, videos and ebooks. A question has arisen is there room for something in the middle and Apple has wondered for years about creating a new category. Steve says "So let's get to the main event". he is talking about the first laptop Powerbook Apple released in 1991. It was the first computer with a TFT screen, palm rests and integrated pointing device. then Apple launched iPhone in 2007. There is a big gap between the iPhone and laptop lineup Steve says. He declares Apple is the largest mobile device company by revenue even bigger than Nokia. Steve says we started Apple in 1976 and 34 years later we just ended our quarter with $50.6 billion yearly revenue. App Store now has 140,000 applcations and more than 3 billion have been downloaded. Steve is on stage, "Good morning and thank you all for coming". 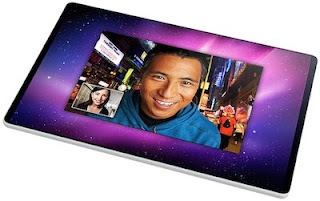 Apple wants to kick start 2010 by introducing a magical and revolutionary new product. He is talking about iPod sales and Apple retail store. Apple sold their 250 millionth iPod few weeks ago. The event is about to start, it complete silence here and lights are dimming. Apple online store is still up. Now we have to silence our phones as the program will shortly begin. Can you believe Apple stocks are down just before the most rumored event is about to start. just five more minutes to go. Just 10 more minutes before the event starts... Will Apple focus only on the tablet or announce some other products too? We are all inside the hall and as usual there is a large Apple logo on the stage. It's a surprise that Apple online store is still working, normally its down by this time. Till the event starts you all can read the latest rumors related to Apple tablet event via the link below. Welcome Everyone to TechzTalks's live coverage of Apple media event. We will be doing live coverage of the Apple event on Wednesday January 27th at 1PM EST / 10AM PST. 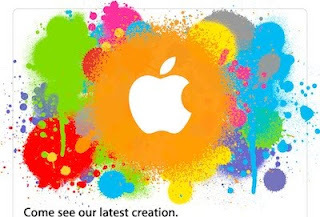 Apple sent out invitation for the event that will be held at Yerba Buena Center for Arts in San Francisco last week. It is rumored that Apple will be introduced their new tablet at the event. There are also rumors that Apple will preview iPhone OS 4.0 and update iTunes and iLife. Our live coverage of the event will being 15 minutes before the scheduled start please join us then at live.techztalk.com. For us also these are the most legitimate looking Apple tablet pics we have seen till now. We will find out for sure if the images are real or not on Wednesday. We will do the live coverage of Apple event on January 27th on live.techztalk.com.